NOTE: All fuel cell parts can be ordered from the Fuel Cell Store. Links for the exact parts are currently unavailable. 1. 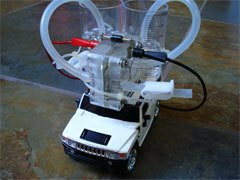 Convert the RC Hummer from battery power to fuel cell power. Install the 5V DC to DC step up circuit with the PCB modified for 3.3V output. Connect a pair of 2mm banana connectors to the input terminals of the DC to DC step up PCB. 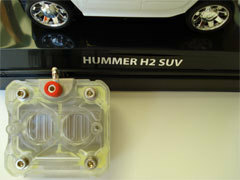 Connect the PCBs output to the positive (+) and negative (-) terminals of the Hummer’s battery box. 2. Fill the gas storage cylinders with distilled water. Attach two 6-inch lengths of silicon tubing to the cylinders. Plug the other end of the hydrogen cylinder tubing into one of the tube stubs on the black terminal side of the fuel cell. Plug the other end of the oxygen cylinder tubing into one of the tube stubs on the red terminal side of the fuel cell. Attach two 2-inch lengths of tubing to the two remaining hydrogen side and oxygen side tube stubs. 3. 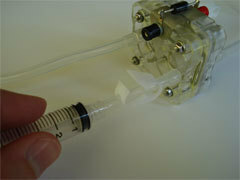 Fill the fuel cell with water by drawing water out of the 2-inch tubing with the syringe. Repeat this process on both the hydrogen side and oxygen side of the fuel cell. Seal these short lengths with two clamps. 4. Connect the solar panel’s positive (+) terminal to the red, oxygen side of the fuel cell. Connect the solar panel’s negative (-) terminal to the black hydrogen side of the fuel cell. Place the solar panel in bright direct sunlight. 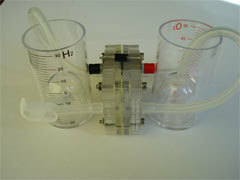 The fuel cell will begin to produce both hydrogen and oxygen by electrolysis. In a low winter sun, this gas production process can take approximately 30 minutes to fill the two 30ml cylinders. 5. When the cylinders are full of gas, disconnect the solar panel from the fuel cell. Connect the 5V DC to DC step up input to the positive (+) and negative (-) terminals of the fuel cell. 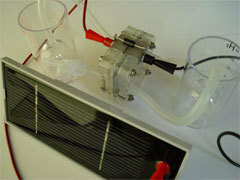 The fuel cell will produce a rock solid 2.2V of electricity. 6. 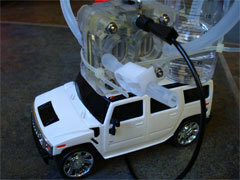 Switch on the Hummer and drive around. You should expect about 12 minutes worth of driving from 30ml of hydrogen/oxygen. 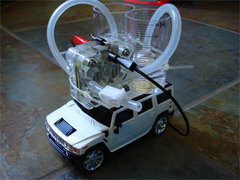 When the gas is depleted, return to the “gas pump” in Step 4 and disconnect the Hummer and reconnect the solar panel for beginning the electrolysis process all over again. Discover other, more practical, ways of using fuel cell technology to replace wasteful alkaline battery consumption. It looks wonderful!!!! I'll try to ask my teacher in science if she will allow us to make one of that.... it's perfect for our investigatory project but it seems that we are going to spend a lot of money... but anyway.... thanks!!!! this website rocks!!! I'm a 1st year student in the Philippines..... thanks for everything!!! God bless!!! Very nice design. I wonder has anyone ever tried doing a prototype as an alternative to the electric and nitro powered RC toys that people use? btw did you use portable solar panels in making this? Xaxa small Hammer!!! Very innovative, I am just joking. If you have been tired of shopping on streets, and like a certain brand of shoes, we are here assist you. Shopping online is not special now, but our store sales brand cheap shoes online. We offer major brands of footwear, whether you are looking for elegant evening pumps or high heels or sandals, they are always here for you. You always can buy a pair of good quality but cheap shoes at our shoes store.